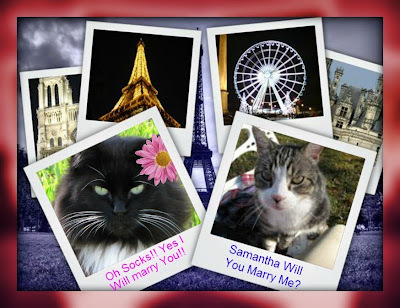 Samantha says Yes To Socks Marriage Proposal!!! Go HERE To See The WHOLE ROMANTIC STORY! Hurray! ConCATulations to you and Socks, Samantha! How romantic it all is. Congratulations to both of you. Woo hoo! Congrats to you two lovebirds, you make a wonderful couple and what a romantic date in Paris! After romantic Paris I'm not surprised :-) Congrats! When is the big day? 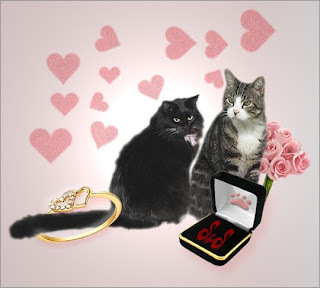 Aw, concatulations to you both! ConCatulations to you and to Socks!! We're so happy for you! Whoa! How exciting and romantical! OMC! This is such eciting news! We await further news with mousie-baited breath. Woot Woot! Concatulations beautiful Samantha! We're all over the moon happy for you both! A BIG ConCATulation to you both ! Oh, a wedding...how wonderful! We know you'll be a beautiful bride, Samantha and we all wish you both lots of happiness.